A common image of the Amish is one of a people rejecting modern conveniences. While practices vary among groups, Amish do in fact use a large measure of modern technology. This may range from everything from solar panels to diesel-powered laundry machines to cell phones. Amish churches regulate use of technology through a set of oral guidelines known as the Ordnung. Amish leaders aim to slow or prevent change if a given technology is seen to be a threat. Amish see threats in technologies which provide easy contact with worldly ideas and values (television, automobiles), or those which may break down the family or community, by serving as distractions or eliminating the need of relying on others in one’s community. Amish also feel that certain labor-saving technologies take more than they give, robbing their children of the ability to learn the value of hard work, for example. In some cases, after careful evaluation, consensus may develop around a particular technology, which may lead to its being adopted by the church district and incorporated into the Ordnung. Why do Amish avoid certain technology? Amish do not forgo technology from a belief that modern innovations are evil. The Amish are cautious over what a given device can introduce into a community, however. The automobile is one example—when a family owns motor vehicles, mobility is made much easier. Family members may spend extended periods away from home, affecting family ties. Easy transportation can bring one to cities and other areas which Amish tend to view as place of worldly temptation and sin. However, Amish acknowledge that the car has real benefits, and most perceive a need for the car in certain situations. Some Amish may hire a driver and Amish “taxi” for transport to the hospital, for large shopping trips, and to visit relatives in other communities. An Amish business owner may also have an English employee who drives him on business. The Amish draw a line when it comes to owning a technology, vs. using it. Generally, owning a given technology is seen as more threatening, as it tends to allow the technology to become part of everyday life, and may make use too convenient. Amish are aware of the admonition that “the luxuries of one generation become the necessities of the next”. Certain technologies are generally considered alright to be used, however, in certain ways. 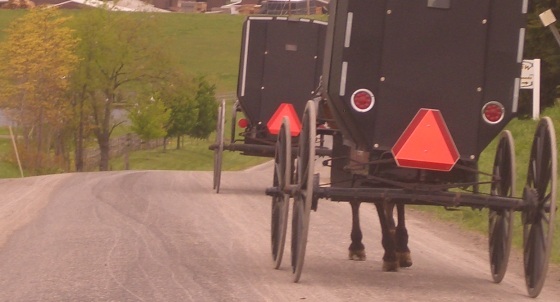 As seen in the example of the car, while an Amishman will not own or drive a motor vehicle, he may occasionally hire a driver to take himself or his family on longer trips which would be outside of the range of the horse-and-buggy. The inconvenience and expense of hiring a driver, however, usually discourages frivolous use. However, the Amish consider personally operating a car to be a step too far. In much the same manner, Amish may use technologies in certain situations, though they wouldn’t necessarily own those technologies, or use them in other circumstances, such as in the home. Builders may use power tools when far from home and lacking any other source of power, an Amish office worker may have an internet account and use a computer in a non-Amish workplace, or a business owner may make use of electric lighting while running a market stand rented from a non-Amish person. In recent years Amish have struggled with issues that have arisen due in part to the miniaturization and proliferation of technology. Difficulties have been introduced in some communities with the rise of easily-concealed technologies such as cell phones. Cell phones can not only easily infiltrate the home but typically offer internet access as well. Amish use a variety of other technologies. These may vary from small home appliances to power tools to batteries. The Amish may derive power from battery electricity, which may be converted to 110-volt current through use of an inverter. This allows battery power to operate devices that require higher voltages. They may also use pneumatic or hydraulic systems to power some equipment and appliances. Amish have long made use of unequivocally non-threatening conveniences such as flashlights and calculators. At the same time, possession of such technologies such as radios, the internet, and television remain off limits in the Amish Ordnung, though some Amish may be exposed to these in the workplace and in other venues. Amish value tradition, placing more stock in the ways of their forefathers than in the latest innovations. At the same time, economic and practical pressures exist, and they realize that in order to survive, and provide a viable lifestyle for their youth, they must at times adapt. Thus, one has seen more technology usage permitted in recent years, particularly in conjunction with the rise of small business in Amish society. Nonetheless, technology is an issue heavy on the minds of many Amish—one Ohio Amishman describes technology as “a main concern of 90% of bishops”—who see allowing too much technology as a serious danger to their way of life. Amish use technology selectively, thus not completely ruling it out. Some Amish disagree on whether—and how much—use of certain technologies is actually necessary, however. One sees these disagreements reflected in both individual opinion and across church districts and affiliations, resulting in a variety of practices. But the idea that the Amish shun technology and live as people did hundreds of years ago is incorrect. Amish Online Encyclopedia: Do Amish use electricity? ; Do Amish use telephones? and Do the Amish use computers and the Internet? 14 responses to Do Amish use technology? Related to this issue of technology, how do Amish heat their homes in winter? I know there’s no one right answer. Speaking in general terms, though, what technology do they use? Hi! We r doin a S.S. fair on Amish people! thx 4 the help!! where can i find a wringer washing machine? i need a wringer washer, hopefully not too pricey! can be used if usable. I know that Amish use batteries in many devices, but how do they recharge them? Can the Amish use solar power to power their homes, since it runs on batteries? The old-order Amish that don’t allow reflective tape, triangle, or lights should not be allowed on the roads. The only protection for old order Amish buggies are tiny kerosene lamps with a red lens, and it cannot be seen for more than 100 feet away. Scripture puts loving thy neighbor very high up on the list priorities for living a good Christian life. One only has to drive on the hilly, curvy, roads of Holmes county once at night during a rain storm to understand how dangerous it is for old order Amish on the roadways. Every time I have to drive in Holmes county at night when its raining, I am terrified of hitting one of these buggies, even though I only drive 35-40 mph on a 55 mph road. I would have the nightmare of hurting old order Amish on my conscience for the rest of my life. And for me that seems inconstant with the commandment to “love thy neighbor as thyself.” Just my two cents. I also am petrified of hitting a buggy here in Tennessee. The danger the Amish face on the roads makes me shudder. If only the ‘English’ would allow the Amish their own roads. Sounds nice, but also don’t see how you’d create an Amish-only road system. Widening shoulders and adding buggy lanes is a lot more possible and this you do see in some places. In Europe there are separate road systems for buses, cars, and bikes, except for in the oldest parts of the cities. This makes it much safer for anyone not in an automobile, and makes bus rides faster and hassle-free. Only an American would be so dismissive of conveniencing people other than themselves. Describing what is available for buses/cars/bikes as “separate road systems” may be a bit generous…at least based on my experience around Europe over 15 years, what I’ve seen is more hit-and-miss. Anonymous…What you stated is not true. I was born in Europe and know this first hand. I do agree that Europe far surpasses our transportation system, but then Europe is a lot smaller than America. Your dislike of Americans show. That is sad. We are not all dismissive. I don’t know of anyone over here that would not love a better transportation system. However, with our debt and infrastructure problems, the cost would be prohibitive. Hopefully, one day, this will happen. I live not far from a Mennonite community. People are very considerate when we see their buggies on the road. You might get a little frustrated sometimes…especially if you are in a hurry, but it is no worse than being stuck behind a slow moving farm vehicle, or stuck at a train crossing. I love seeing the buggies. It reminds me of a much simpler time. Also, to add, all of the above add much to our society. What is the author of this page? I need it for my citation. Leave a reply to Do Amish use technology?